Death of scaffolding – meet façade gommage® dry cleaning system. Mark Styles, managing director at Thomann-Hanry® explains how his unique system – façade gommage® – offers an alternative to scaffolding in the exterior cleaning industry. “As ‘falls from height’ remains one of the most common causes of fatalities and major injuries in the construction industry today, with more than five incidents every day*, Managing Director of leading building cleaning and restoration company Thomann-Hanry®, Mark Styles, calls the property industry to avoid scaffold when possible, especially when cleaning the exterior of buildings. “In the building cleaning industry today, the use of scaffold is largely avoidable bringing huge benefits to the safety of workers who can instead work from the more secure environment of an enclosed cabin. With frequent incidents, the reassurance of cleaning a building without the use of scaffold is appealing to the workforce as well as the proprietor. We want to highlight this and help re-enforce this message across the industry.” comments Mark Styles. In addition to the safety implications, avoiding unsightly scaffold when exterior cleaning works take place ensures the business can run as usual, minimising loss of trade, maximising profit potential and maintaining an ‘as normal’ functionality, whatever the business – especially beneficial to those in retail or hospitality trade. 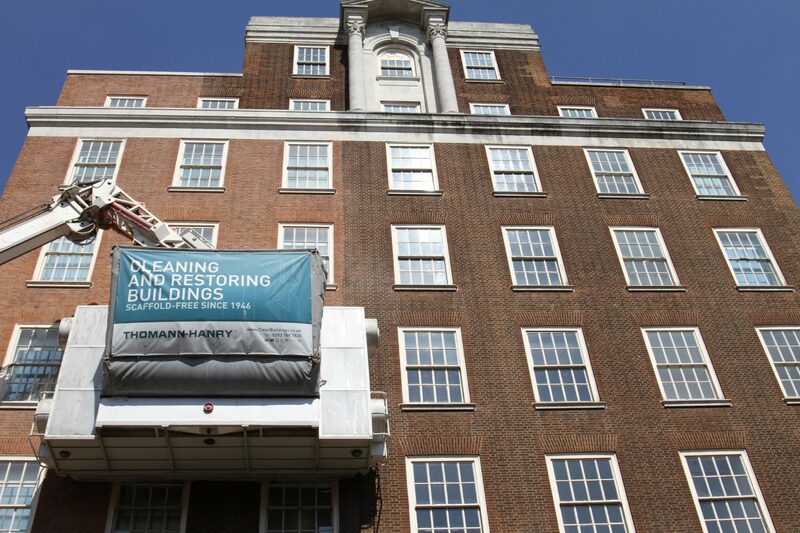 Thomann-Hanry® is currently in the process of cleaning Primark on Oxford Street, London – with a high footfall location maintaining the flow of trade is critical to the business and was a driving force as to why façade gommage® was chosen as opposed to scaffolding. Lack of scaffold also ensures vastly improved security during the operational period – a particular benefit to sectors where security is paramount such as banks or hotels.